Chloe is an estimated 3 year old, black and white, spayed female Pit Bull. 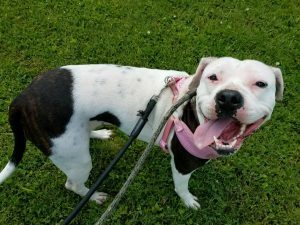 Chloe’s current owner found her in an abandoned home in February 2018, and rescued her with the intention of getting her healthy, and keeping her, however as Chloe has healed she has realized Chloe needs a different home. While Chloe loves people she is not great with other animals. She chases cats and while she was polite with a small dog when she got into her home, as she settled she became dog-reactive, and her family feels she needs to be an only animal, and with a person who has experience living with a dog-reactive dog, or is willing to learn. Children are unknown, and while she is a loving dog, she is enthusiastic with her snuggling and may be too much for small children. 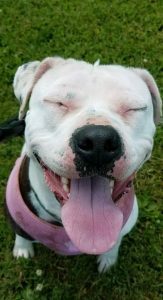 In the home Chloe is a real snuggler, and has the true pit bull velcro dog personality – she just loves to be loved and will hop right into the lap of a stranger and shower them in kisses if she gets the chance. 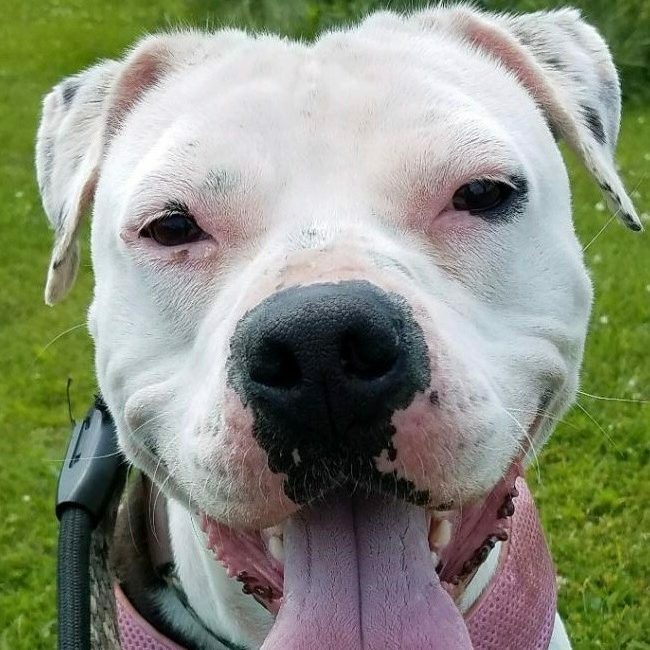 Chloe has had a difficult start, right after being rescued she needed an emergency spay for a pyometra, and needed to be treated for Lyme disease. She is all better now and is current on all vaccinations, as well as being on flea and tick and heartworm preventative. Her beautiful white fur leaves her skin a bit sensitive to the sun, so care should be taken not to leave her in the sun too long. If you are interested in meeting, fostering, or adopting Chloe, please fill out an application through Peppertree and we will forward it to her current family! Because of her dog/dog issues Chloe is living in boarding and everyone is eager to see her back in a home, with family to spoil her rotten. In the right home, she would be an absolutely wonderful companion.